** During Xmas, New Years, Easter and the Formula I in Budapest and other fair periods surcharge may apply! A full-day excursion, which will show you the beauty of the Wachau. Through this romantic scenery full of history and legends the Danube winds its way past charming old villages and steep vineyards. The old castles tell us about the former importance of this trade- and trafficway, one of them - Durnstein - especially famous, because here King Richard Lionheart was imprisoned, while waiting for his ransom to arrive from England, raised by his faithful Minstrel Blondel. During a romantic boat-trip the history comes alive. The heart of the Wachau is the old wine-merchants town Krems. The highlight of this excursion will be the visit of the Benedictine abbey of Melk, one of Austria's most famous Baroque buildings, which together with the Wachau area, won the award for "Best Historic Destination of the World" in 2008. Possibility for lunch at the Abbey Restaurant at Melk. We start the evening by driving along the Ringstrase on our way to the Viennese amusement park, the Prater. A ride on the Giant Ferris Wheel will give you a marvellous view over the city. Then we drive through the wine tavern village of Grinzing to Neustift am Walde, where the artists of the 1st Viennese Heurigenshow will entertain you with a selection of famous waltz melodies, polkas and romantic arias & duets from popular operettas! A good evening meal including 1/4 liter of wine together with the unique atmosphere at the wine-tavern and you will certainly need nothing more to set you back into the 19th century. A half-day excursion which shows you the most beautiful sights of the southern part of the Vienna Woods. Passing the Roman City of Baden which is famous for its thermal springs, we drive through the romantic valley Helenental to the former Mayerling hunting lodge, (visit of memorial chapel), where Crown Prince Rudolph together with Baronesse Vetsera died tragically in 1889. In the Cistercian Abbey of Heiligenkreuz (1133) you visit the medieval cloister which houses the remains of the last Babenberger. We then pass the Holdrichsmuhle and arrive at the Seegrotte. After a boat ride on the largest subterranean lake in Europe you leave the Vienna Woods and return to Vienna. As a great addition to this tour, we recommend the new musical "Rudolf-Affaire Mayerling" at Raimund Theater. With Vienna Sightseeing no waiting time at Schoenbrunn Palace! 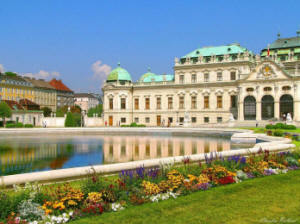 This tour will give you an overall impression of the most significant historical sights of Vienna. Along the Ringstrasse we show you numerous grand buildings, such as the MAK, the State Opera House, the magnificent Museum of Fine Arts with its world famous art treasures of the Habsburgs and the Natural History Museum, the cultural district the MuseumsQuartier, the Hofburg (the former Habsburg winter residence), the Parliament, the City Hall and the Burgtheater. The highlight of this tour will be a visit of the showrooms of Schonbrunn Palace, once the summer residence of the Habsburg family and home of Maria Theresia. On the way back to the opera we pass by the Belvedere Palace, the former summer residence of Prince Eugen, which houses the largest and the most precious Gustav Klimt collection in the world. We start the tour from the Chain Bridge. First, we take the Margaret Bridge and drive over to Buda. We stop in the Castle District and during a short walk we show you the main attractions of the area. We walk to Matthias Church and to the Fishermen's Bastion (from where you can enjoy the beautiful panorama).Next, we drive to the Gellert Hill (Citadel) and show you the most spectacular view of Budapest. We then take you across the Elisabeth Bridge to Pest and show you the famous Central Market Hall, followed by the largest Synagogue of Europe and the City Park. We pass by Europe's largest thermal spa, the Budapest Zoo and the Amusement Park, after which stop at the Heroes Square (with statues of the most famous Hungarian kings and dukes). We then take the Andrassy Avenue to downtown Pest, pass by the Opera House and the St Stephen�s Basilica. We then get off the bus again and take an interior visit of the impressive neo-gothic House of Parliament (guided tour incl.). During the tour we offer a brief overview of the last 1000 years of Hungarian history. The Tour ends in the city-centre. FULL DAY DANUBE BEND TOUR : DURATION 10 HOURS | Operating: WED.,THUR., FRI., SAT., SUN., 10.00 A.M. (BOAT TRIP - 01.05. 01.10. IN CASE OF LOW-WATER AND DURING WINTER-TIME RETURN TO BUDAPEST BY BUS ) / IN WINTER 01.11 - 31.03. - OPERATING ON SAT. ONLY - 09.00 A.M.
AN EXCURSION INTO HUNGARY'S HISTORY - WE LEAD YOU TO VISEGR�D, THE FORMER ROYAL RESIDENCE (FASCINATING VIEW ON THE DANUBE VALLEY) AND TO ESZTERGOM (CENTER OF THE CATHOLIC CHURCH) - AFTER THE INTERIOR VISIT OF THE CATHEDRAL AND OPTIONAL LUNCH WE CARRY ON TO THE BAROQUE ARTISTS' VILLAGE SZENTENDRE (GUIDED WALK) - Return to BUDAPEST ON THE DANUBE BY BOAT - THE TOUR ENDS AT THE PIER/CITY CENTRE. Budapest has many faces. This vibrant city calms down a little bit at nights, lights are lit up, and a new city comes out from the twilight. We created this program for those, who would like to enjoy the wonderful view of the city swimming in lights in a romantic candlelight atmosphere, and have a romantic dinner what is prepared by Hungary's only one Gault Millau rated chef, on a boat with live music. We will take you on a 1,5-hour-long cruise on one of our air-conditioned ships. After dinner you can also admire the panorama from the open upper deck of the ship. We drive to the Castle Hill and discover the area of the Royal Palace (not incl. in City Tours ). We show you the main attractions of the district: Castle Theatre, Palace of the Hungarian President, buildings of the National Library and the National Gallery. During the walking tour you can enjoy the charming panorama view of Budapest. A ride on the Castle Hill Funicular (opened in 1870) takes us to Adam Clark square, from where we walk over to the Pest side by taking the oldest suspension bridge of continental Europe, the Chain Bridge. After this spectacular walk we take a Boat Ride on the Danube (Duration 1 hour / soft drink incl.). MAGIC HUNGARY Half Day Tour. April- October: Tue., Fri., Sun. 09.00 a.m.
Visit the second largest Baroque Palace of the world in Godollo. After only a 30-minute drive from Budapest we arrive to the former summer residence of Queen Elisabeth (Sissi) and Francis Joseph (Habsburg Emperor & Hungarian king 1867-1916). This interior visit and the tour through the gardens of the Chateau, gives you a glimpse of times under the Austro-Hungarian Empire. With the help of our guide you will become acquainted with the secrets of the private life, the hidden doors, bedrooms and lovers of the royal couple. Next, we drive to a traditional Farm where you will be welcomed with a Hungarian Pogacsa and with the national welcome drink, palinka. Horsemen will take us for a Carriage Ride through the area and will invite you to a traditional Horse Show. This small baroque city is located at the Danube Bend, at the meeting place of the river Danube and the Pilis Hills, in a beautiful natural setting. With a 25-minute drive from Budapest, we reach this picturesque Artist's Village called Szentendre. We stop at the Caprice Jewellery Manufactory, wander around the baroque settlement, built on medieval ruins and go along the narrow streets up to the panorama point. We then simply enjoy the special atmosphere of this village. We stop at the Confectionery Museum (buildings and people made of marzipan) and invite you for a cup of coffee with a slice of Hungarian cake. Then you will have the opportunity to go for shopping or to visit the Margit Kovacs Ceramic Museum. During the summer (between the 1st of May and the 30th of September) we return to Budapest on the Danube by boat. Transfer to Herend, one of the world's largest Porcelain Manufactory (founded 1826). Following a guided tour through the rooms we invite you for a coffee (possibility for shopping). Next, we drive to Lake Balaton (the largest fresh-water lake of Central Europe) and visit the abbey (founded 1055) on the Tihany Peninsula. Following a 3-course lunch in a csarda (tavern) restaurant, we go to Balatonfured (with the oldest spa in Hungary) and walk along the famous promenade. Finally, we return to Budapest.